An orangery or conservatory will transform your home whilst providing an extra room and valuable floor space which is almost maintenance free. We offer a range from standard lean-to sunrooms to large conservatories / orangeries tailored to your individual requirements in a maintenance white PVCu or wood grained foils. High security, provided by Yale multi-point locking systems. Profile designs & colours to match your windows. 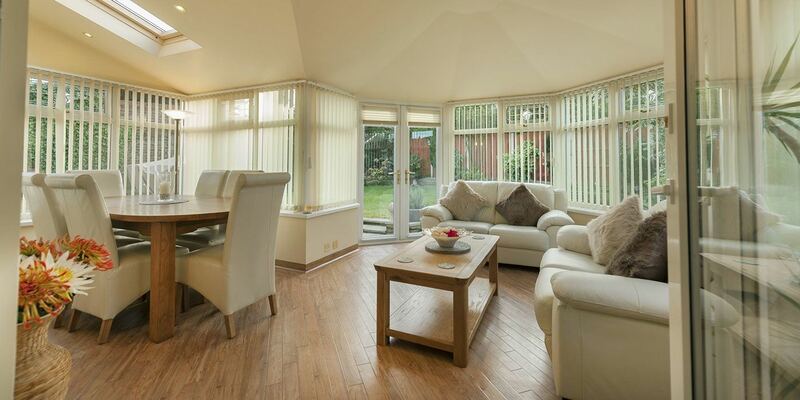 If you would like to use your conservatory all year round, why not consider having a tile effect roof. This will enable you to reduce heating bills in the winter due to the thermal structure and U Values of 0.18 (England & Wales) combined to give you a comfortable ambient temperature all year round. Alternatively we offer 25mm or 35mm polycarbonate which provides an exceptional level of thermal insulation and comes in a clear, opal or bronze effect. We also offer a 28mm glass roof which has excellent thermal insulation, reducing energy costs. Also our range of self cleaning glass can reflect heat away in the summer months but retain heat in the winter time when you need to keep the warmth inside. Fanlight locking has central reversing claws operating in opposite directions providing a secure lock. Conservatory doors come with Yale locking hook claws top and bottom, operating in reverse directions providing a secure anti theft protection.